If you are interested in giving blood, you can visit www.redcrossblood.org and use the sponsor code unc to find blood drives happening on campus. The Holiday Carolina Blood Drive will be held on Tuesday, December 11 from 7:30am to 1pm in Fetzer Gym. If you would like to donate before and at the Holiday Drive, you will need to donate before Tuesday, October 16th. 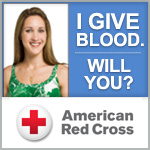 You can donate blood every 56 days (whole blood) and 112 days (double red cell). Give the gift of life! Give blood. This entry was posted in Community on September 21, 2012 by Lynn Eades.